I am not perfect, I’m going to make misstates. Ooops. I mean, I am going to make mistakes. Not only that, I will probably squander time and talent making less than great choices. Let’s face it, no one walks through life bathed in a flawless light of maturity and virtue. I can’t be afraid to make errors, they’re going to happen. But there has to be a way to get better at figuring out how to use my abilities the way God wants me to use them. Fortunately, there is. It’s taking the time to sit back and pray for knowledge to choose the right thing. Then, it’s taking on the problem and making the best decision possible. The process is sometimes called discernment. I think It’s a lot like panning for gold. You grab your sifting pan filled with ideas, confusion and lack of clarity, and start working to eliminate all the things that have no value. Moving quietly, with peace and patience, all the dirt and sludge is eventually washed away. That pearl of wisdom lies just under all the things that appear so dreary, worthless and distracting. When I was a junior in high school, my mother asked me that age old question: “What do you want to be when you grow up?” Oh jeez. I had no idea. She wanted to help me pick a college that would give me the education I wanted. Trouble was, I didn’t know what I wanted. I knew I couldn’t do math to save my life, so that was out. I had no drawing ability, my art work looked like third grader did it. I looked through books, I studied college majors. Nothing was really calling my name. So, as teenagers usually do, I called an expert. My expert was my seventeen year old best friend. She was going to be a nurse. Really? That sounded good. Sold! So, four years of college and a degree later, I was a nurse. I had over twenty years of happiness and fulfillment in my profession. I thank God for leading me to something that I loved to do. Through my mothers question, God was calling me to discover my role in the world he created. My discernment process included spending quiet time reviewing my own talents, and paging through books. Then he waited for me to be prepared to talk to my friend. He spoke clearly through a high school buddy, hoping that I would see my future in hers. Our God speaks in so many different ways. Life experience, past successes and failures, input from family and friends, finances and free time resources…all speak to direct our thoughts in the quiet work of discernment. This process of decision-making shouldn’t be rushed. There are going to be times of waiting. I know that the Lord waited for me to be good and confused before he led me to my friend. But it was all part of his perfect plan. Ceil … I love this ‘panning for gold’ description. Wow. So excellent. That quiet peace, that patient wisdom, the still small Voice speaking into the depths of who we are. Hi Linda! That idea of gold panning came to me in a dream. It was so vivid, and so true. I’m glad you liked it! And you got to do the real thing, so that makes it even more immediate. The quiet…that is the key isn’t it? So hard to make time for, but so worth it. There are times I wish He would speak in a loud voice. 🙂 However – aren’t we blessed to have a God that really cares about what we are doing, and gives direction in so many ways? I’m glad He spoke through your friend! Hi Mari! Well, I do too. It would be nice to hear it ‘loud and clear’ sometimes. But I agree with you, it is great to know that God is constantly calling and waving for our attention. It just takes me to calm down and listen…and notice. I’m not always very good at that. I’m glad he spoke through her too. I told her my nursing career was all because of her. She didn’t remember our little talk at all. Well, I did!! Have a peaceful night Mari! Wonderful, wonderful post, Ceil! Full of good advice and so well said. I love your writing style! Thanks for being a blessing to me. Hi Pam! Thank you for your encouragement! I’m so glad that you liked the post, it was close to my heart, that’s for sure. I’m so glad that we are connected through out blogs my friend. We can support each other on our path to Christ. Great story, Ceil. Just before I read this, I was preparing my lesson for my little first grade religious education class. The chapter we are on is “God Speaks to Us.” The chapter focuses on being quiet and listening to God speak to our hearts; but as you’ve shown here, his voice can be “heard” through so many situations. I’m so happy to hear that you are a nurse; I am just imaging the lives you’ve touched with your beautiful heart. Hi Kathleen! I love that the focus is on ‘listening’ even in the first grade! It’s such an important concept, and those little ones will soak it up like sponges. Hope you have a wonderful class this weekend! You know how much I love a good word picture – and that idea of *panning for gold* was a nugget of insight. Such a great analogy for the process of discernment. I love the story behind your decision to make nursing your career. Funny, I always thought I wanted to be a teacher. But when I graduated from high school I didn’t want to take 5 more years of school to become one. Ironically, it actually took me six years to graduate from college – including a very misguided foray into dental assisting. In my case, following my best friend into her chosen career was a terrible misfit for me. I ended up finally graduating with a degree in English Lit. I like to think that my degree and love for teaching has somehow come together in my writing. God does indeed speak in many ways. The challenge is to always listen for His voice, and then to be willing to do what He says!! Hi Sharon! Wow, I don’t think I could ever do dental assisting either. All those TEETH! LOL! Ceil, I seem to have lost my comment. No worries Sharon. For some reason, your comments went to my Spam folder. Very weird. But I fished you right back out again! Hi Roxie! What a grace to turn to the Lord to help you with what treatments you should do, and to keep your peace. That is such a testament to you relationship with him. That really inspires me, thank you! May we never forget that that God will pour down his wisdom and love to those who will listen. What a promise, what a grace. My husband always tells me I’m lucky to know what I want to do. Most people don’t, he says. He said that when I worked as a state employee and wanted to be a writer–he said it was far more frustrating to not know what you want than to know what you want and not be able to do it. Hi Stephanie! I agree with your husband. How frustrating to know that you want to do something, but have no idea what that is. Just like me as a teenager, it’s not a fun place. But it sure suits you. You have a wonderful career and great things going on at your blog home. God is so good! Thank you for stopping by, it’s so fun to see your name pop up. I can’t wait to stop by your blog. Great post Ceil! I remember having a similar discussion with my mom. Funny thing is I wanted to be a nurse and she convinced me out of it. Instead I went into teaching. Hi Joyful! I’m sure you were a wonderful teacher. Nursing and teaching are very connected, I think. Lots of instruction for both professions. It’s so interesting how we find out path in life. Your mom was instrumental in your way; my teenage friend was for me. God knows what works! What a day you’re having with blogging! I am so useless with computers myself. My answer for everything is ‘reboot’. It’s kind of surprising how well that works actually. I hope you’re back on track soon! I have a lot of respect for nurses. I can’t understand why anyone would want to be a nurse but I am so grateful they do from my experiences in hospital. Thank you for all the good work you did/do as a nurse and I’m so glad God encouraged you to do it. May He always bless you for it. Hi Victor! There are so many things I can’t do, I am so glad that nursing worked for me. I can’t understand why people want to be CPA’s or dentists. Yuk! Yes, we are all fearfully and wonderfully made. Thank you Ceil for your kind words about my book. I have responded on my Blog. God may have encouraged you to be a nurse but He also gave you a great talent as a writer. Oh dear Ceil – I have ‘failed’ again. I read carefully – with admiration – what you wrote and all the comments, but I never had a call to do anything special and have really spent my life just doing the best I have been able; often in difficult circumstances. The only job I enjoyed was working as an A/E receptionist (what you would call ER). Perhaps I was only good at that because having been on the receiving end of treatment I could empathise. Maybe I was just meant to be a Carer? I carry that out to the best of my abilities and with love. Hi Andrina! Oh my, you have not failed AT ALL! My call to nursing was something I saw in retrospect. I sure didn’t see it at the time! I was just a teenager. Just like you are now looking back at your A/E (thank you for defining that for me!) experience and understanding how you came to it, that’s what I did too. God moves in his ways, and I don’t always see it until later. Actually, it’s mostly later!! “I couldn’t do math to save my life.” Spoke volumes to me Ceil. We are kindred spirits. LOL Seriously, this is an insightful post. So many are doing what they don’t want to do because someone expected them to do a particular line of work. I know someone right now going through the agony of anatomy, physiology and math because his dad told him nursing was a good field. Too many do this in the church as well. Hi Bill! Believe me, my math skills are wanting. My husband would often wonder how I could dose patients correctly. God bless the pharmacists who measure it all for us! I feel really bad for your friend. The path to being a nurse is so hard. So much work. I hope he can learn to love it? Or decide it’s time to move on. What a waste of time studying something you don’t like. I agree about the church comment. I have heard of priests and ministers who entered the seminary because of a family expectation. I pray we can all respect the ability of our children to discern their path for themselves. We can always help, but shouldn’t live through them. This is God talking to me! I really needed to hear this today. Middle daughter, poor decisions… the fact that I can’t get her to make good ones… for my part, I was not very merciful yesterday in this area. But I am sharing this with my daughter tonight. Thanks Ceil! Hi Monica! Oh, I just praise God for how he works. Wow! I’m overjoyed that this helped you. I hope it will help your daughter too. I had challenges raising my children, you are not alone. I was less than charitable plenty of times. Its just the frustration taking over. There’s always time to make amends and try again. I will be praying for you my friend. I was once accused of over-analyzing. Better to over-analyze than impulsively jump and find yourself up to your eyeballs in alligators! Great post! Hi Lulu! That is a great saying, I’ve never heard of the one about alligators and eyeballs. I may borrow it from now on! No one wants that, so I think the analyzing is a good way to go. That’s just another name for discernment. Just FYI, I contacted the spam filtering host that runs the program for WordPress blogs. Hopefully they have fixed the problem. What a day for you! Let’s let the experts take on this problem, while we go find a good bottle of wine and some bread and cheese. Wine and whine. Sounds perfect!! Oh, by the way, the problem still isn’t fixed. At least it seems to be all right on your blog. You did say wine, right?! Heck yeah I did. Red or white?? Isn’t it amazing how our friends dictate so much of our lives throughout our youth??? What an amazing thing that your friend lead you to a career that you loved and that God had planned for you! Hi Susannah! I guess our parents were right. It really does matter who you hang out with as a child/teen. And yes! I used to be kind of embarrassed about describing why I became a nurse. So uninspiring! Because my friend was going to do it? Yikes. But now I know that God was waiting for me to ask. I’m glad I did! I love this post and its message. We certainly are all in the same boat of not being perfect! It is hard to wait on God’s timing, but when we do, we get such a wonderful reward. He puts such wonderful people in our life (even us bloggers :-)) to give important messages He wants us to implement into our lives. I just love your heart, friend. Hi Kim! Thank you for your kind words about the post. I always think about how generous God is in allowing us to do such big things. Like influence the outcome of people’s work lives! We are all he has here on earth, and he wants us to help him. I hope I can always be open to his call (although I have a long way to go). The way all of the dots get connecting in our lives can seem so unrelated when we living in the middle of the moment. But how to look pack and see the hand print of God directing our paths is awesome. Hi Wanda! I know what you mean. Especially living through dry times, or hard times. I always wonder why I have to go through that stuff. But I know that I will see God using everything for my benefit, or the benefit of others. And I wonder why he used my teenage friend to direct my path? But really, it was genius. He knew I’d listen! This is a wonderful post, Ceil, filled with much wisdom. We’d so like it if God just bellowed from heaven. Yet so often it is that still & gentle nudge that tells us the way we should go. Grateful to have been nudged in my life! Blessings! Hi Joanne! Thank you for your encouraging comment about the post. I appreciate it! You are so right, I’d love a good bellow! But he prefers to use us and his whisper. It sure worked out well for me. What a blessing you have undoubtedly been to so many throughout your nursing career. Thankful for giving souls like yours! Hi Mindy! Well, I hope I have been. I have some great memories of my nursing days, I learned a lot too. You are very kind in your comment my friend. Thank you. I know we all serve in our work, and in our homes. Good words that filled my heart. Thanks, Ceil! Hi Sandi! Thank you for your lovely comment, I really appreciate it. I hope to see you again! 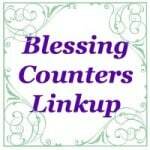 Hi there- I’m stopping by from Count Your Blessings, Thanks so much for these words of wisdom— I feel like seeking discernment in a daily necessity for me! How to best use my time, wanting desperately to follow the Lord’s direction in my life… I think the older we get, the more time-sensitive we become 🙂 Blessings to you! Hi Laura! Thank you for stopping by! What I really wanted to do, my parents said no to. Or at least get a degree before I pursue what I wanted to do. I can’t say they were wrong, because I have been blessed along the path that I ended up taking. At the same time, I know that I’ve learned to encourage my children in the right direction without taking away what they really want to do. With that said, I wanted to be a flight attendant. I love to travel and meet people, always have. I had dreamt of being a flight attendant for years. A family friend was an international flight attendant for years and I loved to listen to her stories. My parents, who grew up in a generation that said a degree was one of the most important things to achieve in life, wanted me to go that route first. I respected them. I did not argue with them. I ended up with a good life, but I still completely feel those emotions of not being encouraged to go for my goal. It wasn’t a bad goal. It wasn’t as though I was working in the circus, or being a bar maid. So it has made me realize how I will do things differently with my own children. I don’t fault my parents. They did the best they knew how to. It was the way that they grew up. They really wanted the best for me, in their eyes. Oh Patty, I’m so sorry that your dream didn’t come out the way you wanted it too. You know what? I wanted to be a stewardess too. And my mom said “No daughter of mine is going to be a glorified waitress.” That was the end of that. When I was a nurse, I wanted to switch jobs, and I wasn’t sure what specialty to go to… My mom said “How about the airlines? You’ll get free tickets to travel!” Um…that’s weird. I’m glad you’re happy with your life path, and that you know you won’t squash your children’s dreams. You sure learned that the hard way. Who knows? If you had become a stewardess, you may not have met your husband, or had your beautiful children. God works in mysterious ways…. I have read some things by Joyce Ruffing who also describes discernment, especially with a spiritual director as panning for gold. It is a great image. I find discernment one of the foundational question in spiritual direction and one I would love to write more about. sounds like you do too. by the way, love your opening sentence. made me smile. Hi Jean! That panning for gold analogy actually came to me in a dream. I woke up and thought “That’s it! !” Sounds like it’s a well-used comparison, but it was new to me at the time. I like your applying it to spiritual direction. That works well too. And I think you should write more about it, I know you’d do a great job! I truly believe that all things happen for a reason. You were fortunate that you recognized early in your youth what God’s plan was. XO P.S.—LOVE your panning for gold analogy! Hi Marcia! I believe that too. Everything just flowed to my girlfriend. God is amazing, that’s for sure. And you’re right, I was lucky to know early in life. I didn’t know I could go to school and not have a major all planned out! Isn’t it funny how quickly we made such big life decisions at such young ages? I wish I had a little of that now. lol I’ve had some great life experiences from those quick decisions, even ones I hated, I stuck with long enough to find out why I was there and learned to love it. It is wonderful to see God’s guiding hand in our lives. Hi Topaz! It’s really a grace to be able to stick out a bad choice and learn from it. Not everyone can do that! To see God’s guiding hand in bad times is something I am still working on. I want to see it like you do! I think we’ll be working on seeing his grace and direction all our lives. I can only hope to get better at it as the years pass. You are so right, he is always working on us. Good thing, because I need the help! Thank you for your kind words Topaz. What a lovely grace it was to meet through our blogs. Hi Shelly! Thank you for your kind words about the post. Getting used to slowing down and really taking the time to discern is a growing habit for me. I have learned the hard way it’s best to think it over and pray on decisions. Letting God in is always a great idea. A lovely encouragement to be seeking God’s will, and to be trusting that He is leading our steps at the same time … And He is – in His loving, subtle and yet so clear way! Hi Nina! I completely agree with you. He is so loving, and often subtile. But if I listen and see the signs, I’ll be fine. May I always be aware of his signs! I love your common sense approach and simple description of discernment! That’s wisdom! We need this wisdom in many areas of our lives. The Holy Spirit is a still small voice. But, when we have godly wisdom as foundation, such as good friends and other godly associations we will be able to hear that gentle voice, giving us the confirmation we need to make quality decisions in life. And I’m so glad God placed on your path the right friend who influenced your life in a profound way and also, for making you a blessing to many for it. Hi Shade! I agree that the voice of God in his loving Spirit is always there, but not loud. He wants us to be still, and zero in on his presence. I know that when I follow his promptings, I am really at peace. That’s my clue that I am doing the right thing. I’m really glad for my friend too! I told her how instrumental she was in choosing my vocation, and she didn’t remember the conversation at all. Funny! We can be used so tremendously, and not even be aware. God certainly does speak to us in so many different ways. This is a subject I have been feeling led to write a post on as I have had quite a few instances of this lately. Enjoyed your post. Great post Ceil! Discerning what I need to do has been a struggle for many years. When I do follow what God has in store for me, I am absolutely joyous! It is always the best plan and I am so thankful that God is right along side directing my paths. Now I need to learn to listen more carefully. I’ve found that praying daily for guidance has helped immensely. Have a blessed day! Hi Verona! Thank you for your kind words about the post. Thank you for visiting today, and I look forward to getting to know you better! Please don’t take this the wrong way, dear Ceil, but it makes me “feel better” when I hear of others who struggled in Math 🙂 I couldn’t do Math to save my life either! That four letter word could make me the grumpiest person alive when I was in High School. Your post was well-written and a delight to read; I always appreciate your sweet honesty. Have a wonderful week, my friend. Hugs! Hi Stephanie! Oh, I don’t take it wrong at all. Happy to have someone else in the “Anti-math” club! I’m amazed by how our Lord knows us so well, and how He gently guides us. Hi Anita! Thank you for reading two posts, and commenting on both too. I appreciate your spending the time! Good to know I have a ‘bad at math’ buddy. Man, it is just not my strength at all. But the Lord has given me many other talents, and I am grateful for them. He has gifted you too! Praying that we will both be aware of the guidance of his Spirit every day.